Last week’s piece on narrow handlebars was a popular read as it highlighted the lengths – 38 centimetres in case you asked – some riders go to in the search for aerodynamic advantage. Sure, the extreme position looks way cool and the ‘SLAMYOURSTEM’ kids would worship the ground you roll on. But let’s be realistic here – you’re not Philippe Gilbert and twice-daily Ashtanga yoga sessions and a closet full of Lululemon probably isn’t going to get you there, either. But if you’re 1.83m tall with a rockin’ Euro fauxhawk and still think you can pull this off, go on and try – we dare you. Let us know how things went after your resultant chiropractor appointment. Huang is right that Gilbert has a low position (but note he’s 1.79m tall). Regardless of Gilbert, rider position on bikes has changed substantially over the years but the resulting improvement in aerodynamics is questionable. So what’s the change? Well seat height has changed little over the years, set as a percentage of leg length with small variations to suit individual habits and bio-mechanical fashions. Instead the change in rider position has come in the frame size and the difference in height between the seat and the bars. Take the three photos and look at the riders and their elbow angle. Francesco Moser in the middle has a small bar to seat drop, you can almost draw a line across from his stem to the rails of his saddle. He’s famous for his low position and style on the bike but actually has very high bars compared to today’s riders. Moser’s flanked by Bradley Wiggins and Sylvain Chavanel. Wiggins isn’t in full flow but you can see the example of straight arms. Meanwhile Chavanel is going full speed with his elbows bent but is on the tops of the bars because they sit lower. Were he to put his hands into the drops then his elbows would be at, say, 45° rather than Moser’s right angle. The gap tends to grow with taller riders. 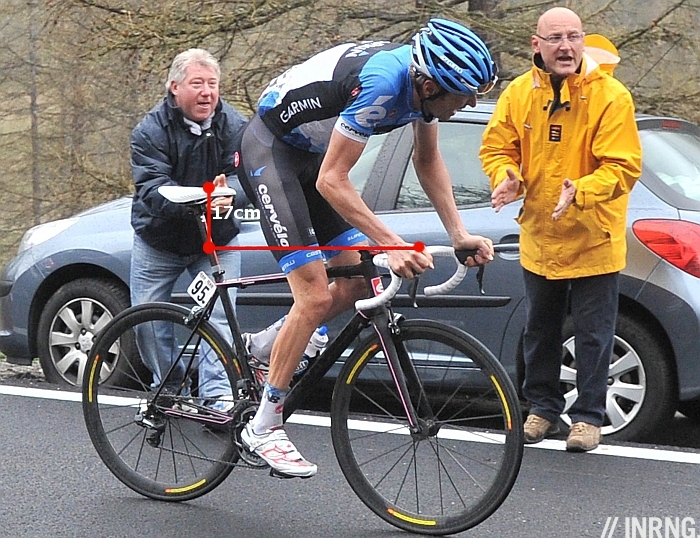 Hesjedal stands at 1.88m (6′ 2″) tall and yet he rides a comparatively tiny 56cm frame. Much of that is based on his extreme position, which includes a gargantuan handlebar drop of over 17cm. Even with the shorter head tube afforded by the downsized frame, Hesjedal still runs a 140mm-long stem with a -17° angle, and even removes the upper headset cover to gain another couple of millimeters. Note the drop is to the top of the bars, the part you hold when you want to sit up. Only Hesjedal has a greater drop than when the likes of Moser used a low profile bike to break the hour record. So what’s behind the changes over the years? It’s hard to identify when it started but it seems the trend picked up in the late 1990s when the compact or sloping frame arrived, notably thanks to Giant, Mike Burrows and the ONCE team. Teams used to custom frames or at least half-centimetre increments suddenly had to chose between a more consumer friendly XS, S, M, L, XL label and make up the difference with the seatpost and stem. It worked as a smaller frame was both more rigid and yet lighter. The smaller the frame, the more it could be marketed as lighter than its rivals, a valuable competitive advantage. For example an 800 grame frame today would probably weigh 1,000 grams if built to yesterday’s geometry. These smaller frames came shorter head tubes and perhaps road tradition meant nobody wanted an upward sloping stem? Either way over the years leg position is the same but the position of the bars has changed. I also wonder if there’s an element of natural selection at work. If you can hold a position on the bike as low as Hesjedal then you have an aerodynamic advantage, even when climbing or perhaps especially when climbing because you are low even with the hands resting on the top of the bars. Whether this position is natural or thanks to yoga, it can help give a big advantage on the others therefore, everything else being equal, we’ll see more riders using a low position in the pro ranks than elsewhere. But it can also be inefficient if it is uncomfortable or unsuitable. Another form of evolution is aesthetics or put simply, looking “pro” on the bike. There’s even a website dedicated to the praise of low positions: slamthatstem.com. A smaller frame looks lighter and the position appears more aggressive. But there’s nothing professional about back pain and even the big name pros look like amateurs when they sprint with their hands on the brakehoods. This post follows the ideas expressed by others, you might have spotted the trend too. Gerard Vroomen’s done a whole series on posts on it here, here, here and here and more recently FDJ’s team coach Fréderic Grappe mentioned how few riders can bend their elbows. The bikes have not changed much over the years, advances in tubing or gearing are arguably incremental improvements that track technological improvements. Even narrowing the width of the bars in still a relatively small shift. But over the last 20 years there has been a switch to much smaller frames and lower bars although the bio-mechanical response just seems to a change in the elbow angle. It might be more efficient to raise the position but I’m not sure if the sport will go back. Vroomen tells how Cervélo raised the head tubes on some models but surely other manufacturers will be worried about adding weight and looking old-fashioned? Imitating the pros is one thing but find out what works for you rather than copy the measurements of a stranger. I am same size as my father when standing but two frame sizes smaller when riding. Hesjedal looks extreme but Gilbert is more normal. I’m not sure many of us copy all the way, you will see many ordonary Sunday guys with stems sloping up. Maybe I start yoga tomorrow? Is it fair to say that more powerfully built riders bend the elbows, but those weaker in the upper-body tend to use straight arms? 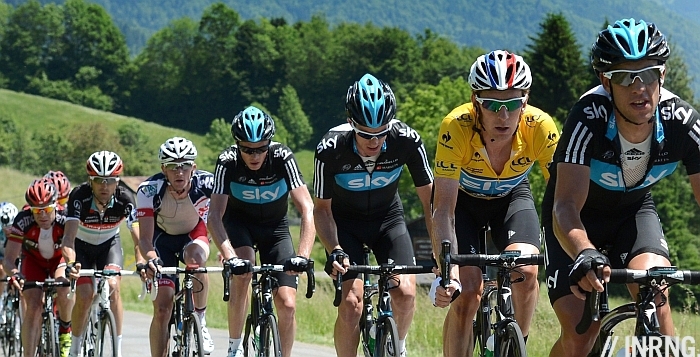 Chavanel, Cancellara and Sagan all seem to have stacked arms, compared to say Schleck or Wiggins. I guess they do gym work for the upper body to have the strength for that position? Spartacus has very flexible hamstrings. It’s essential for his TT position. I think it is more a case of the skinny guys having excessive drop, with the seat so high to accommodate leg length. eg Hesjedal 17cm drop from seat to handlebar. The climbers often like their a fair amount of leg extension whereas the meatier guys have a more powerful lower seat position. All this leads to the drop you are working this. The three photos above demonstrate this well. No doubt flexibility plays a big part. I think it is more a case of the skinny guys having excessive drop, with the seat so high to accommodate leg length. eg Hesjedal 17cm drop from seat to handlebar. The climbers often like a fair amount of leg extension whereas the meatier guys have a more powerful lower seat position. All this leads to the drop you are working this. The three photos above demonstrate this well. No doubt flexibility plays a big part. Riding a low position like that takes core strength, not upper body strength. If you are using your arms to hold you up, you’re doing it wrong and you will be hurting in a big way in no time. I ride 56 and 58 compact frames. Same brand, almost identical models. Both are dialed in with almost identical measurements (stack, reach, drop, etc). However, a noticeable difference in handling. My guess is because of difference in length of wheelbase and stem length and, as a result, weight distribution. The 56 is not nearly as stable in high speed descending. That said, more snap on the 56. Less spacers and lower stem angle on the 58 does look cooler. Snap? Handling? Aesthetics? Paralysis sets in when taking a horse off the peg. good story. many of us prof can ride low when we want. but the main thing is for us to be in good condition when we are on the velo. important is remember produce most power. low is not the answer. I think that to compare Ryder’s position with shorter riders is not a good comparison. He has longer arms and torso, and obviously needs more drop to get into the proper position for comfort, power, and speed. I know this, because I am 1.91 meters and have had the same issue of bike fit for years with the new tall head tubes. Bar position also counts when standing while climbing or sprinting, as a relationship between the bottom bracket (and cranks) and the actual handhold (drops,/hoods). Although I can ride a slightly higher bar position while seated or when doing less-than-100% efforts, when I try and sprint on the drops of a higher position bar I don’t like it. I don’t know if I lose any power (my max power varies based on fitness and I tried a 2 cm higher drop bar only in the off season) but I found it so much better when I reverted my bars back to my normal position, 2 cm lower. In addition a longer stem puts more weight on the front wheel. I prefer the feel for cornering and don’t have any problems with the more forward position even on steep switchback descents. I can get the same fit with a longer top tube but given the choice I’d rather fit my bike with a 12 cm stem with regular bars or a 14+ cm stem with compact bars. My custom geometry frame was set up with a 12 cm bar and regular bars in mind. This keeps the front wheel a little more under me while fitting me well. I’ve been accused of having a “low” position (someone suggested submitting my bikes to SlamThatStem.com and I did) but it’s really just a function of my torso length (longer so it allows me to have a flat back). Both my stems are -17 in those pictures, so they’re flat, like in the old days. Finally, as a counter point to the whole “do yoga to hold a low position”, I find that my bad back forces me to hold a lower position. My doc told me in a matter-of-fact voice that I have “several burst and bulging discs” which is why I collapsed in the yard one afternoon (and a few times before that). However I can do 5-6 hour rides with just normal slight discomfort and I prefer to be on the drops more as the ride progresses. I spend most of the end of long rides on the drops. Being leaned over “all the way” beats leaning over slightly. I have to consciously stand upright when doing dishes because if I lean forward just 5 or 10 degrees my back starts bothering me right away. I imagine that if the pros found that a position didn’t allow them to finish a 5 hour Classic or a 3 week Grand Tour then they’d adjust for it. Likewise I think those guys can tweak and hone their position and over many 20-25k mile years they’ll figure out what works best for them. Its all about proportions, viz torso and arm to leg. Take me 66″ tall (well short then) but with 32″ inside leg and arms to match the torso, so stem only 110mm, with compact short reach bars and a straight (no layback) seat post gives me a comfortable reach, saddle to top of bars drop 7cm-8.5cm my smallest frame 44cm tcr, biggest 50cm CAAD 9. I think the first compact Giant road bikes were around mid-1990’s and I am pretty sure they were aluminium? At least the ones we bought were! It all differs between people. “The lower the better”? Don’t think so. Interesting article. After Ryder won the Giro, I remember reading an article (link below) that talked about the way his time trialing had improved in the last couple of years, to the point at which it allowed him to become a legitimate grand tour rider. Much of his improved tt abilty was credited to raising and narrowing his tt bars, which made him more aero but didn’t sacrifice power output. I wonder if we’ll see a similar evolution in road positin in the future. Perhaps we already are with the previous story here about narrow bars. One of the keys to aero is frontal area. Lower is only better if it doesn’t compromise width. The problem is that the “bottom” of lower is fixed by BB drop and even dropping your bars 4-5″ rarely drops your shoulders that much. However, if you can get your elbows inside your hips and prevent scooping air you dramatically decrease the frontal area effect. Regarding bike fit, one of the ways that riders get lower is to get further forwards. With the exceptions of guys like Sparticus, the current peloton is much further forward than 1990, not mention even earlier. It used to normal for guys to have KNOPS-2-3 cm (knee about 2-3 cm behind the pedal spindle). Now we have a lot of bikes with steeper seat tubes and zero setback stems. As you move forward your hip angle opens and you can get lower up front AND you back flattens. I had the chance to meet Ryder last summer. I had noticed his hunched-over position for the past couple years and was curious as I am a bit taller than him, yet ride a really upright position (old and weak). Standing next to him, it seemed to me that he didn’t actually stand straight, and was always a bit hunched in his upper torso. It would be interesting to see if this is a natural posture or has been developed through time riding such a small bike. I find very tall people often stoop – I’m moderately tall (186cm) and I catch myself doing it too. Combination of leaning/looking down (even slightly) to speak with people and constant fear of banging your head on things I guess. He could have accentuated this from riding a small frame/low stem too of course. A great bike rider either way. Did you get to speak much? We just exchanged a few words and he signed a couple autographs for my kids. It was at an event in Victoria, Canada, his first time back to his hometown since the Giro win and I happened to be in town on vacation. It should be noted that the drops on handlebars have become more shallow in response to this trend. I’m just guessing, but I would say that the handlebars on Francesco Moser’s bike probably have 1-2 cm more drop than the ones Hesjedal is using in the picture. The old style setup gives more variation in hand position. Compact bars are designed with hands in mind. The subtle curve of compact bars as opposed to ergo bars means you can have hands down low in the drops without excessive radial deviation of the wrist. This is particularly important in smaller riders. Not having a huge drop is also another useful part of such handlebars which makes them useful for smaller riders as well. Posture critics should be measuring saddle-to brake hood drop, too, since the brake hoods is where 90 percent of the riding is done. The older bends usually put the levers 2-4 cm lower than the top of the bar. Comparing Moser and Gilbert, taking in the back angles and the relative height of the elbow to the knee, they really aren’t that much different. Moser does appear to have more forward reach available. Even with a 14 cm stem, the reach on Gilbert’s 50 cm frame is ridiculously short for a rider his size. He liked to be so low they had to custom build a stem/fork system for his TT bike. Fit is evolutionary. Most of us have not reached “peak performance”. If you mapped your first fit position and timelined yourself through the years – you would notice you naturally stretch/bottom out and can accomodate a more aerodynamic position. This process though, needs to be active – not passive. You need to try different positions and see what works because everyone’s body is different. Pros have the luxury of countless hours to try a variety of positions during their development and training season. At PRO level watts, you can save a lot of energy with a good position. The obvious position has revealed itself over time to be that “flat back”, and it makes good sense. If you think of your upper body as a board – the smallest frontal area is thickness X width. Any rotation [up or down] of the horizontal board increases the frontal area – meaning more power is now required to overcome wind resistance. How one approaches the flat back is the result of your phyisiology – which is extremely complicated. No single fitting session or season can really “lock” it in for you. You have so many variables to deal with. Look at the three pictures – Wiggo, Moser, Chavs – they all have a flat back, but display their preference in how their arms relate to the rest of the position. I imagine riders who do not exhibit this position have their reasons – power drops too much to outweigh aero benefits, breathing problems, power is too great to give up in return for aero benefits [I’m thinking of Stijn Devolder], race terrain [all uphill], the way their hips are built, the way their back bends [Saul Raisin], etc etc. Look at Hesejdal in the Giro – when did you ever see him in the drops? I rarely did. My guess is that the hoods are his choice position, so naturally he puts them in the lowest position possible [-17 stem, rotated down]. Websites like slamthatstem encourage aggressive riding, which is nice – but if everyone ends up riding off their tops and hoods – there isn’t really a point. I suppose the ergocurve handlebar market and hood design focus ignited from people not being able to ride in the drops for long periods of time because their position was too low. I think though, if one wants to ride with no spacers and a +12cm stem – they should look at a smaller frame to accomodate those requirements vs. changing out the stem and sawing off the steerer tube on their current ride. And yes, narrow bars should stay. VDB was right. I think the first “compact” frame design was the Cannondale Headshok front suspension mountain bike frames. The suspension resided in the steerer tube and wasn’t “adjustable” in length, meaning the fork/steerer tube was always a certain (very tall) size. To make up for this “one size fits all” fork Cannondale made a wide variety of extreme size stems, with some crazy angles and lengths compared to regular stems. I want to say that one of the stems was something like 17 cm long but I don’t remember exactly. It was also a weird angle, super high or low depending on whether you flipped it or not. It’s impossible to know who wast the first, other than to say Cannondale definitely was not. The innovator from the 80’s/90’s Charlie Cunningham built a few compact road frames. At the time, they were very unusual. I doubt he was the first, but what made it easier to make was the mass production of long mountain bike seatposts. Some consumers were then okay with the smaller frameset concept because they got used to it with mountain bikes. Giant definitely drove the industry into 3-4 sizes well before carbon fiber framesets. It’s a tremendous manufacturing advantage if you can get consumers to adopt to it. Ride the past few years on a Giant TCR Advanced compact frame (1,70m / 54cm frame), and after almost a year of experimenting found that the best set-up for long rides and sprinting for me is to have a 110mm stem, dropped by two spacers. Should ideally have a 100mm stem but felt too cramped when sprinting, as well as lower back being too compressed. Tend to train/race mostly with hands in the drops as Belgium tends to ‘enjoy’ healthy winds and have needed to have my chin almost on the bars to prevent front wheel from levitating in 50km+ head wind! Kung fu ensures my spine and muscles are flexy! Am toying with the idea of next bike being 52cm instead of 54cm, with 5-10mm longer stem, so I can stretch out more in the sprint with my nose even lower…but would prefer a professional fitting (costs around €140) before making such a move! Thanks for keeping the blogs/articles coming! There’s nothing very aero about presenting the full length of both arms square to the wind. Moser only has his upper arms against the wind, his forearms are very aero. And the aero cost? Just a couple of inches of comparatively narrow head tube or stem. Read Michael Hutchinson’s book The Hour about how he optimised his aero position to break the athletes hour. Narrow bars, but high and with a long reach (he had a bike with a long top tube especially). So the position tends towards a tribars position. The pros know this anyway. Look how many rest their arms on the tops in a pseudo tribars position when they’re on lone breaks. I have lots of trouble rotating my pelvis to get good seat bone contact on my saddle. I’m left with an embarrassingly tall steer tube and even with all my spacers and a compact handlebar I still can only manage to get into my drops when absolutely necessary… extreme head wind, or dicey group ride. Anybody have any advice on work I can do to increase pelvic mobility (I’m assuming that is the problem). I have done yoga for years and can comfortably get most of my hands under the ball of my feet when doing a hamstring stretch. great post by the way Inrng. Saddle choice is important in being able to get lower. You dont just flex your spine when getting lower on the bars, the pelvis should rotate forwards. To do this comfortably you need to be able to rest on your ischiopubic ramus without squashing the all important soft tissue between your legs. SMP saddles and even Specialized saddles are good for this, among others. But then again, the body is a tensegrity structure, so it might not be as simple for a saddle for you. I rode in the 80’s with diamond pattern frames and they were generally bigger sizes in those days. Even with the allowance for sloping top tubes of modern frames, the seatpost would have much less protruding out of the frame than they do now. I now err on the small size as it’s better for me. In those days I would have ridden maybe a 22″ frame but nowadays probably the equivalent of a 21″. I think the geometry is what has changed. Angles are more innovative and varied and seat tube length and head tube length don’t seem to be as closely related these days. It all adds up to much more extreme positions. Well, the pros are only fit by the most proficient bike fitters in the world, so they can’t all be wrong. Also, who’s to say that Quill-stem people wouldn’t have preferred to slam the stem if they had the option? My mate slammed his stem experimentally and chipped a tooth on his uncut steerer the very next day. Do you think position might depend on the style of riding the rider first entered the sport in? I consider myself primarily a mountain biker and prefer a smaller frame for better handling, and make up the difference with seat post and longer stem. I use the same concept on my road and cross bikes because it just feels more comfortable, in spite of the objections of my roadie friends. I know in a cross race I can’t out fitness the roadies, but I can make up significant time on technical sections. I know Ryder came into the sport as a mountain biker, maybe that influences his comfort in smaller frames. On a side note, I have always been intrigued by Levi Leipheimer’s position on a bike, maybe because it is the opposite of my setup. All frame and no seat post. My guess is because of his height, he started riding larger frames and just became comfortable with that style. I think that a big reason for the larger drop is due to integrated shifters/brake levers. In Moser’s day the pros spent most of their time in the drops; pros today spend most of their time on the hoods. The hands of those in each era are in more or less the same position relative to the torso but the different location on the bars changes the amount of drop used. Depends on which race you’re watching. Windy spring classics means the drops, grand tours and climbing, the hoods. If anyone needs to be aero it’s Cavendish. Here’s his bike. Looks like minimal drop from saddle to bars. He is. Here’s a good comparison, Cavendish side-by-side with Thor Hushovd. See how much lower Cav is on the bike during a sprint? I’d bet his top-end power is actually lower than Greipel’s even when he goes faster. It’s a good example to demonstrate how in general you don’t need huge drop to be aero. Though I now realize most of inrng’s discussion is not for the extreme case of sprinting. Still, Cav’s setup is a useful visual. His top end power is hundreds of watts lower than Greipel. He’s shorter and lighter but yes, also more aerodynamic. Note he also sprints like a track rider with the back locked in place, allowing him to deploy all the muscles in his legs from his glutes down. Greipel also seems to have worked on his position over the last two years, he looks lower. I think it’s a misconception that smaller frames are stiffer. To achieve the same position on a smaller frame, a rider will need a longer stem, more spacers, more seatpost, etc. The complete bike will be less stiff with these longer “appendages” as compared to a larger bike that integrates more of its total mass into one integrated frame. True and a smaller frame is not always going to make a lighter bike as a seat post is heavier than a seat tube. But the smaller frame can be stiffer when tested in a lab or on a bench for flex, a test often used by magazines for reviews. I think the key here is that yes the stem and seatpost won’t be as stiff but the BB will be stiffer. So if anything smaller bike, long seatpost gives more “comfort” flex and more power stiffness. I’m not sure I buy that more stiffness = more power transfer though. The XS, S, M, L, XL sizes are not consumer friendly. They’re manufacturer and retailer lazy. Many cyclists must now compromise on bicycle fit due to a limited range of sizes. I used to distribute Vitus in North America and they offered 48-60 cm. sizes in 1cm increments. Most other builders offered the same or greater in 1cm or 1/2″ increments. Far better for proper fit. +1 I remember (wish I could remember where exactly) a comparison of photos of Fausto Coppi and Alberto Contador. The photos were massaged so the dimensions were identical and the positions of the riders was pretty darn close! I would argue the pros get some sort of special bike fit, marketing BS aside – they most often choose (just like the consumer) from too small, too big and close enough which is the reason you see all the wacky stems with super drop or super length. I recall a story about when Paolo Bettini’s team switched to bikes from the big S. Supposedly their gurus measured the Cricket and chose the “proper” sized bike for him but he found it too big when it showed up so went to a local S dealer and BOUGHT himself the next size down to get as close as possible to what he was used to. Especially if a rider has grown up riding the “wrong” frame, you see many of them continue with that same position (remember Sean Kelly?) rather than change everything and start from scratch, risking all kinds of injuries, etc. trying to sit in the “proper” position. Just like the local bozos at your club ride, the pros range from gorgeous on the bike (Moser, DeVlaeminck) all the way to looking like some sort of crab scuttling along (anyone remember Fernando Escartin?) in a position that makes one cringe when looking at it. I’ll second the SMP suggestion, this odd design allows the pelvis to be rotated and the back to be flatter as a result – just like all those coaches tried to drill into us back-in-the-day! When comparing saddle-to-bar drops between different riders, you should first compare the riders of course. I guess a reasonable comparison is how far their hands are below their hip with arms hanging along the body. If you have long legs and arms, you’ll get much lower at the same hip angle. Top tube size factors in too. In any case, I find the ‘slamthatstem’ movement quite ridiculous. Put your bars in the position that suits you best, and ignore the fashionistas! BTW, I sometimes move my bar up and down for different types of rides. I feel that a 1hr tt effort in strong winds requires a much lower riding position than a 4 hour social ride. I think there’s 2 key reasons. Integrated hoods for gear changing and brakes, as mentioned in comments already. Allows a rider to spend less time in the drops to be near the shifters. Also important is the arrival of aerobars in the timescales in the article. I presume riders get used to using aerobars (and thereby being in an aero position on the tops of the bars), then when they are on a non-TT bike, they like being in a similar position, and is often seen, also take on a ‘mock-aerobar’ position. The move to integrated shirter and brake levers is important I think. With their cable routing, they made riding on the hoods for extended periods much more comfortable. On the hoods became the default all-day position rather than on the drops as it had been previously. Take that into account and Moser and Chavannel have a similar position. Wiggo always rides the drops. And I’ve always found that weird. I prefer Moser’s positioning. It looks fast and compact. Anquetil also had the “egg” shape and was pretty fast I recall! Moser and Anquetil were among the most elegant of their periods. Also, any rider who came through Cyrille Guimard’s Renault-Gitane-Elf system, but especially LeMond and Fignon in their primes, were elegant. And prior to Anquetil, Hugo Koblet (usually) and Ercole Baldini should be included. IMO, the key is the different “standard grip” of the bar. back in the days brake hoods were not confortable, and there were mainly 2 positions: top or drop, being the drop grip the “standard”. Nowadays we have the 3 positions: top, hood and drop, being the hood the standard grip, having, as you note on the images, the hoods at the same height as they used to have their drops. Not so. The old bars gave you the tops, two placements on the curved section above the hoods, the hoods, the forward part of the drops, and the flat part of the drops. The squareness of the tops of current bars eliminated those two placements above the hoods, and the “ergo” bars of the ’90s pretty much dictated how you were going to use the drops. Needless to say, I find my compact with double-tap setup more comfortable than the old Cinelli 66, but I have nothing good to say about ’90s ergo bends. In my experience I think that frames has changed. When you buy a frame today, their geometry suit the pros in that it has the bars pretty low. You often need a whole lot of spacers to get the bars to a retro level. and many frames are not even allowing this by only providing a few centimeters. Most frames in the consumer market have slightly to ridiculously extended head tubes anyway. The only mass marketed bikes with trad-length head tubes these days are Trek H1 (now available only on Madone 6 and 7), Cannondale Evo and CAAD10, Scott Foil, Felt F, and Giant TCR. I see a general tendency toward sizing down, however. Pros do it to lower the frontal area, and rec riders do it to shorten the reach. Further to Ryder H’s frame size choices: I just noticed in a Cervelo advertisement which came out late in 2012 that Ryder is clearly on a size 54 P5 TT bike. The sticker is visible in the photo. However, although its an ad to celebrate his Giro win (lots of pink) it doesn’t seem to be a photo of him during an actual race as I can’t see a number anywhere. Could just be a promo shot and he’s grabbed whatever bike was around. Nevertheless, thats a pretty small frame for a tall guy. This article does not adequately address the change in bar shape and hood ergonomics. Moser’s hoods are mounted half-way down his bars whereas modern shifters, due to changes in bar shape and ergonomics (i.e., flat ramp) are mounted in line with the bar tops. You should measure Moser’s drops based on where his hoods are not where his bar tops are. Also Chavenal is not even holding the bars, he is resting his forearms on the bars so as to create a more narrow frontal profile. If he were on his hoods his back would not be parallel to the ground. A lot of talk the riders now are faster training has changed and aero position is needed to become good.takes time and know how to ride low and fast! Dave Moulton’s blog has several insightful articles about how bike fit evolved in time. See for example: http://davesbikeblog.squarespace.com/blog/category/bike-fit. I’ve decided to watch but stop caring about it. I tapped into the Merckx/Moser posture in the ’70s and I’m sticking to it. Moser cuts a pretty slick profile and I don’t see how it can be improved on without anatomical rehab. Might narrow the handlebar a bit, though. Leaped from 40 to 44 around 1986. 42 might be about right; Merckx used 42. Some observations. Contemporary pros seem to be shortening their forward reach. I don’t know whether this is to accommodate the downsized frames, make supporting the upper body easier, or simply because the combination of being that low and reaching forward is too much work. Cockpit geometry of stock road bikes probably hasn’t changed all that much since the ’70s, if you size down a couple centimeters. Well, from the late ’80s into the early ’00s there was a long and low trend, but with a few exceptions (i.e., Felt F, Trek H1), it’s pretty much over. Even the Trek H1s are significantly shorter than the Treks Lance used to win on. But looking at my two main rides, a 60cm ’80 Masi Gran Criterium and a newer 58 cm H2 Madone, both have 57.5 cm top tubes, both have about 21 cm of head tube if you include headset stacks and compression cones, and the angles are virtually identical. Distances between bottom bracket, saddle, and brake hoods are virtually identical without doing anything more extreme than slamming a -10 degree stem with the standard cone on the Trek. Moser has 10 cm of drop in that photo, hardly a “small” drop. He ran 10 cm for most of his career, and was known for having a very extreme position. In that photo he is showing plenty of post on a trad. frame and running a tall saddle compared to modern equipment. The 10 cm is documented in Hinault’s book. I think Moser had it nailed. It’s about the effective aero position that a rider can hold for an extended period of time, and there is no point in lowering the bars beyond the point where you can keep your forearms in an aero (i.e., flat) position.